Travel Portland, the official destination marketing organization for the city of Portland, is partnering with Base Camp Brewing Company to introduce a series of limited-availability #PDXNOW beers as part of the organization’s larger “Portland is Happening Now” winter tourism campaign. In a program spearheaded by Base Camp, 10 Portland breweries have paired up to create 10 different #PDXNOW brews. Each pair shares a particular beer style, but individual breweries have crafted their own interpretations, utilizing local ingredients to showcase the brewing talents found around the clock in Portland. The #PDXNOW beers will be available at the breweries’ respective taprooms from Jan. 24 through Feb. 28. Also available, while supplies last, will be the #PDXNOW “Beerport” passport with tasting notes on each of the beers. 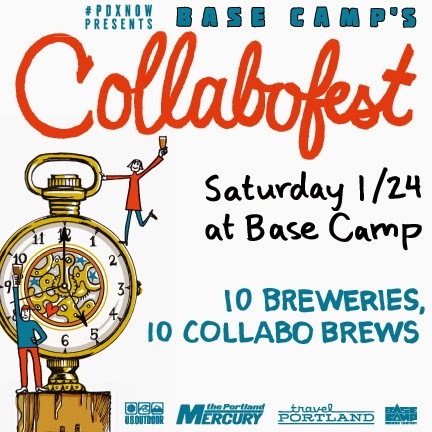 #PDXNOW Presents Base Camp’s Collabofest, Jan. 24, noon–8 p.m.
Beer lovers will be able to meet the brewers and sample all 10 limited-edition beers in one location at the kickoff event. The family-friendly celebration will be held Saturday, Jan. 24, from noon to 8 p.m. at Base Camp Brewing Company (930 S.E. Oak St., Portland). Collabofest will cover two city blocks, feature iconic food trucks Koi Fusion, Gonzo and Grilled Cheese Grill, and host a free, all-ages ski and snowboard rail jam (7-10 p.m.), presented by local clothing brand All The Homies and complete with fresh snow trucked in from Mount Hood. $35 for VIP entry, which includes a Klean Kanteen Collabofest steel pint cup, #PDXNOW Beerport,10 tickets (each good for a 5 ounce pour), tokens for two full pints and early admission at noon, Prices will increase by $5 on the day of the event. For more information or to purchase tickets, visit www.travelportland.com/article/collabofest.